With the recent release of WCF Data Services 5.0 a few weeks ago, I thought it would be a good idea to introduce the technology to those of you that have not seen it before. WCF Data Services for those of you used to creating traditional SOAP based or REST services using WCF has a different purpose and use. It builds upon the Open Data Protocol (OData) that Microsoft created to expose data as resources that are addressable by URIs. 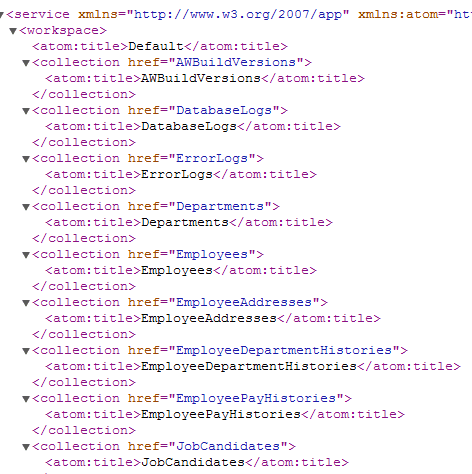 OData builds upon the AtomPub protocol to represent data in a standardized method and then makes it accessible via HTTP. Through REST based services you can access any type of data using the standard HTTP verbs (GET, POST, PUT, DELETE). These services offer a powerful way to quickly expose your data as services without a lot of the manual work involved otherwise. In addition the services are customizable via service operations and interceptors. The OData protocol is something not confined to .NET either. The idea is an open protocol for exposing your data in a platform agnostic manner via HTTP. There are a slew of .NET OData client libraries that sit atop of data services for accessing the data, and there are even libraries in other languages like Java and its OData4J library. So why is this good? Well 1st off we are exposing data using a known and standardized protocol in OData. 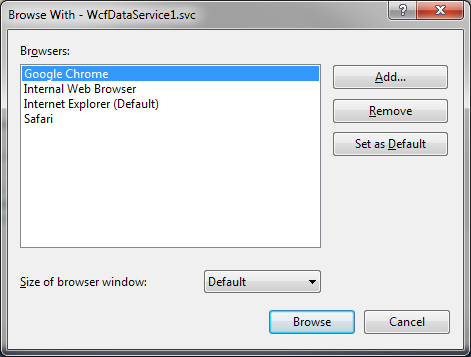 Think of the alternative using a traditional WCF service with a webHttpBinding to create a RESTful service. You would be creating from scratch how your data is being exposed and only you and your clients understand this model; it is not a standard. If you being on new clients to consume your services, you have to explain (typically through documentation) on how your data looks when exposed. 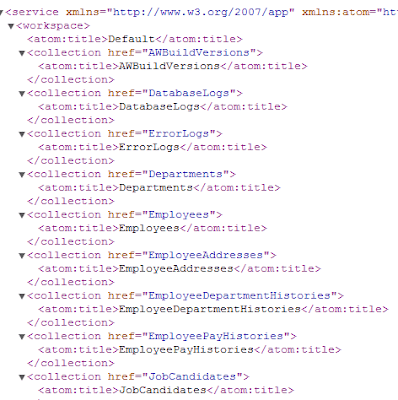 This is obviously not as easy as telling clients that your services expose data that is built upon the AtomPub format in OData which is a standard. The other main attraction of data services is how much custom and manual plumbing work that gets cut out and streamlines. As you will see below, in just minutes I can have my relational data exposed and accessible via HTTP in a RESTful manner via URIs mapped to my entities. In my example I am going to expose some relational data via WCF Data Services from the 'AdventureWorks' database on my local SQL Server instance. I just want you to get up and running to see the possibilities, so we will go through all the steps to preform a simple GET on some of the entities we will expose. First let's start off by creating an Entity Framework model for the AdventureWorks database. If you want to follow along and do not have the Adventureworks database you can download it from CodePlex here: (http://msftdbprodsamples.codeplex.com/). Begin by going to 'Add -> New Item' and under the 'Data' category on the left select 'ADO.NET Entity Data Model'. For this example I am using the AdventureWorks database, so I select 'Generate from database' and then navigate through the wizard to set up a connection, naming conventions (I use the default values for this example), and then I selected all the tables before completing the Entity Framework Model. Now that our EF model is created, we can create our WCF Data Service. I have the new WCF Data Services 5.0 installed which is built upon the OData v3.0 specification, and you can download it from here as well: http://www.microsoft.com/en-us/download/details.aspx?id=29306 In Solution Explorer on your project, select 'Add -> New Item' and under the 'Web' category on the left select 'WCF Data Service (for OData v3)', or similar option if you have an older version of WCF Data Services installed. Upon making the GET request, you can see that I get back all of the information just for the Employee with the ID of '1'. Upon making the GET request with the expand query option you will see the additional related entity information. Try the same procedure for expanding on 'Employee2' to see additional related entity information. So look at this - in just a few minutes we are up and running by exposing our relational data accessible via HTTP in a RESTful manner using a know open protocol. Pretty cool if you ask me, and even better - really useful. This has just barely scraped the surface of what can be done with WCF Data Services. In the future I will expand on this tutorial getting a little more in depth with some of the additional functionality offered. Mr Conway where is the part 2 of this series? I can't seem to find it. Thanks. how do you do WCF Data Services with SSL? will basicHttpBinding work just fine or do I need to change it? In your "Creating a WCF RESTful Service and Secure It Using HTTPS Over SSL" article, it used an interface as the service contract. Since WCF Data Services does not actually need the interface especially in this sample where you only exposed the entities, do you need to add any configuration changes to your web.config or any authentication code lines in your web or application project? @Rajesh - I typically use SOAP services for streaming file uploads as opposed to REST based services. I have not done my own REST based upload API. However, it is possible and might be the way to go next time I have to do this. Hi, nice WCF Data Services Tutorial.Thanks for your help..
Where the hell is part 2 ?